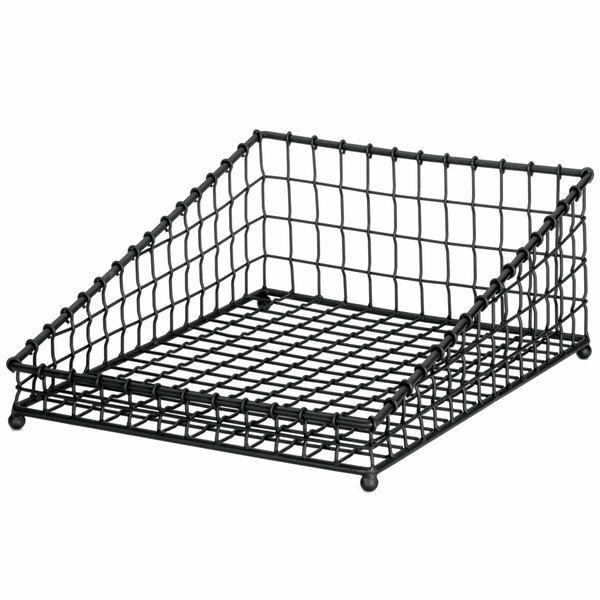 From the Grand Master collection, the Tablecraft GM1519 angled, rectangular wire basket is powder coated for a durable finish and sleek design. From the buffet to the tabletop, this modern angled wire basket provides trendy versatility for any application. The Tablecraft GM1519 basket allows you to use your imagination. You can use this basket to serve bread, bagels, pastries, or showcase napkins or decorative soaps and towels. Tablecraft GMT2113 Grand Master Transformer Rectangular Basket - 21" x 13" x 5 1/2"
Tablecraft GMT2412 Grand Master Transformer Oblong Basket - 24" x 12" x 6"
Tablecraft GM2113 Grand Master Rectangular Metal Basket - 21" x 13"x 5 1/2"
Tablecraft GM1608 Grand Master Rectangular Metal Basket - 15" x 8" x 4 1/4"
Tablecraft MGMT2412 6.75 Qt. White Oblong Melamine Bowl - 24 1/2" x 13" x 5 1/2"
Tablecraft MGMT2113 5 Qt. White Rectangular Melamine Bowl - 21" x 13" x 5"
Tablecraft GMT21125 Grand Master Transformer Collection Black Powder Coated Metal Full Size Rectangular Basket - 20 1/2" x 12" x 5"
Tablecraft 240000 Grand Master Transformer Black Powder Coated Metal Stackable Hanging Basket - 15 1/2" x 9 1/2" x 8 3/4"
Natural Rectangular Wicker Display Basket with Handles - 24" x 18" x 5"
GET WB-953-SV POP Silver Wire Pastry Basket - 18" x 12" x 2"